Novels by G. Donald Cribbs: Friend Friday: 2 Reviews on 2 Great Books You Should Read! Friend Friday: 2 Reviews on 2 Great Books You Should Read! Continuing my Friend Friday Feature, I'd like to share with you two great books I've recently read and reviewed on Goodreads. One is currently available, and another is yet to be published. (Last time, both were as yet unpublished. If you'd like to read about DESTINED by Jessie Harrell and HUNTED by Cheryl Rainfield, read more here.) Since my To Be Read pile is long and never ending, I am sure to have future posts like this for you to keep up with all the great books out there. I hope you'll keep coming back to see what other books I've read, what I think about them, and you'll read them, too! See? It's an all around win. 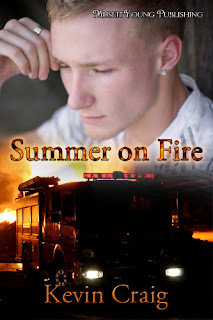 The first book, SUMMER ON FIRE by Kevin Craig is a great read, and a quick one. That's because it's on the shorter side for a book. However, it's short for a timely reason: it was a product of National Novel Writing Month (NaNoWriMo) which happens every November. See? Yet another example of a NaNoWriMo project that has been published. This was published June 30th, so you can read it NOW! Go ahead and click on my GoodReads 5/5 star review, and while you're there, add it to your To Read pile. You can find my review here. Next on the list is THE RIVALS by Daisy Whitney. This is the sequel to Daisy's debut novel, THE MOCKINGBIRDS which is also a great read. I was a fortunate recipient of an ARC of THE RIVALS so I got to read it early. I know, I know, you're jealous. But, trust me, it's worth the wait, and I'd recommend you to read BOTH books to get the full impact. I've also reviewed THE RIVALS at GoodReads with a 5/5 stars rating. I sure have a lot of those. But, I also read the BEST books out there, so you should keep that in mind. Don't worry, I'll judge each book on its own merits. I don't just give those away. So don't see these reviews as flattery. Each one is earned. These writers ROCK. But, see for yourselves and go read my review of THE RIVALS here. THE RIVALS is slated for a February 6, 2012 publication date (subject to change). There you have it. 2 new books you've got to go read NOW. Before you go, please share in the comments what books you've read recently and if I haven't read them, maybe I'll add them to my ginormous To Read Pile. Have a great weekend, and keep coming back for more book reviews! If you like (or don't like) this feature on my blog, I'd appreciate your comment below.